Why settle for plain old beer when you can make a beer cocktail? Here are 6 recipes from On the Coast’s beer columnist Rebecca Whyman (88.1 FM or 690 AM weekdays 3 to 6pm). Combine all ingredients in a glass and stir. Blend with ice until smooth. If you feel so inclined garnish with a slice of lime. Muddle tomatoes, celery salt, and pepper in a cocktail shaker. Add remaining ingredients except beer. Add ice and shake vigorously. Strain into a glass filled with ice. Top with beer and garnish with a celery stick. Combine all ingredients and gently shake with ice. Strain over fresh ice cubes into a highball glass and garnish with a lemon twist. Source: Jasper’s Corner Tap & Kitchen, San Francisco, Calif. Simply combine all these ingredients in a large pitcher, stir and enjoy. 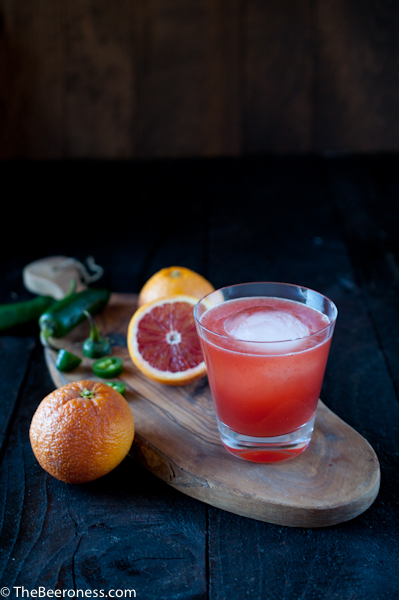 In a shaker filled with ice add the blood orange juice, bourbon, agave, and jalapeno sliced. Shake well, pour through a strainer into a highball glass with ice. Add beer, stir.